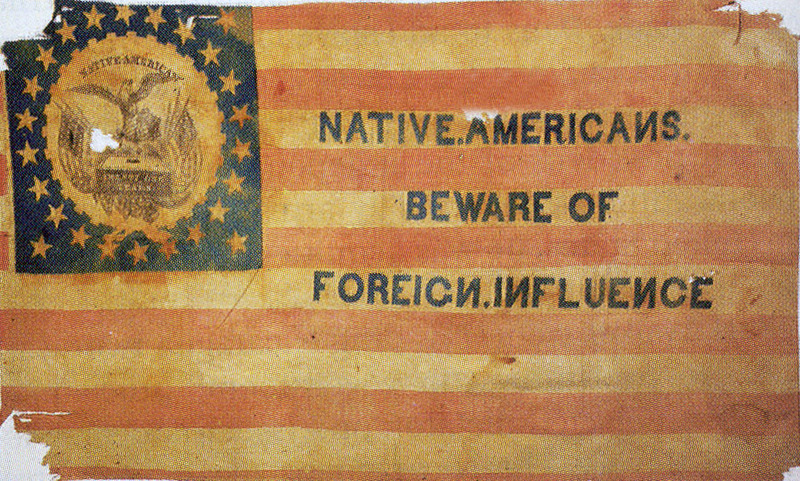 Nativists (composed of white, U.S. born citizens) believed in protecting the interests of native inhabitants of their country against the interests of immigrants. During the 1800s and early 1900s, some native-born white Americans had fears and beliefs about immigrants – especially working-class or non-white immigrants – that fueled efforts to keep immigrants from voting. Some of those fears and beliefs, and some of the barriers to voting created by nativists, might sound familiar today. One short-lived but famous political party came to power because they wanted to restrict the rights of immigrants. The American Party, better known as the “Know-Nothing” party, exploded onto the national political scene in the 1850s. This group dominated politics in the northeast as well as areas in the midwest and southeast that had larger working-class immigrant populations. Some of their ideas, like property rights for married women, were progressive for their time. But their positions on immigrants and immigrant rights were based on ethnic and religious prejudice. They feared that immigrants, especially Catholics, could gain enough electoral power to change ”American values” and institutions. The Know-Nothings were supported by merchants, manufacturers and native-born workers who saw immigrants as competitors for jobs. The Know-Nothing party suggested using many tools of suppression to keep immigrant voters from the polls. They advocated limiting the right to vote to U.S. citizens, and they wanted to make it more difficult for immigrants to become citizens. They proposed laws that set up barriers to citizenship, including English literacy tests, requiring special judges to oversee the naturalization of immigrants, and even a 21-year waiting period before foreign-born immigrants could be naturalized made citizens through legal process. They also fought for changes to state voting laws that would make it harder for immigrants to vote once they finally became citizens. These included literacy tests, restrictive registration laws and laws that imposed long residency requirements before foreign-born citizens could vote. Not all the Know-Nothing proposals were successful. Some politicians fought against them because they recognized that immigrants or their children would eventually become voters – they did not want to offend them by targeting them. Other social commentators condemned Know-Nothing proposals because they singled out working-class communities. But nativists and their allies did manage to pass several measures, including a two-year waiting period before naturalized citizens could vote in Massachusetts. Massachusetts and Maine also passed an early form of voter identification law that required immigrants to present their naturalization papers to local officials three months before an election. The Know-Nothing party disappeared after the 1850s, but many of their ideas and proposals aimed at preventing immigrants from participating in U.S. politics were used to limit voting rights for immigrants later in the 1800s and early 1900s.